Cat Mario is a form of Mario introduced in Super Mario 3D World which he can transform into by using a Super or Lucky Bell. This suit is not limited to Mario, and can also be used by Luigi, Toad, Princess Peach, Rosalina and Bowser. Mario's suit is yellow while Luigi's is green, Peach's is pink, and Toad's is blue, which match their colors (Luigi's suit, however, has rounded ears, a spotted body, and dark green ears and a tail tip, making him resemble either a leopard, a jaguar, or a cheetah). Rosalina's is black, and resembles a tuxedo cat, while Bowser uses a Super Bell to become Meowser, the final boss of the game. In Mario Kart 8, Cat Peach appears as a playable character of her own in the first DLC add-on pack for the game. Cat Mario makes its debut in the Wii U game Super Mario 3D World, gained upon collecting a Super Bell. In this form, Mario can briefly climb up or cling to both walls and the Goal Pole. Mario also has the ability to pounce on enemies from midair to slam into them, similar to a dive attack. He can also claw swipe enemies in front of him (which can spin Cat Wheels, similar to Tanooki Mario tail-whipping Tail Wheels in Super Mario 3D Land), as well as slide into them. Cat Mario runs at a crouching height, and he also breaks into a sprint significantly sooner than in any other form. When Bowser becomes Meowser, he has white and orange fur with brown stripes, similarly to a tiger, a ringed tail, cat ears instead of horns, whiskers, and his nose is black. Also, his hair is colored red, white and brown, and his shell appears to become more blueish. Like Cat Goombas and Cat Bullet Bills, his form is similar to a transformation than an actual suit. However, in addition to this form's abilities, he can also tail whip, like Tanooki Mario, and he retains his fire breath. Obtaining a Lucky Bell also lets Mario turn into Lucky Cat Mario, similar to Tanooki Mario's Statue form in Super Mario 3D Land (though the Lucky Cat form is invincible, rather than invulnerable and ignored, and gives bonus coins while falling); its appearance is similar to that of a maneki-neko. Mario's Cat Suit gains a red bell collar to show he can use the ability. If Mario collects a Super Bell while in this form, he "downgrades" to normal Cat Mario, unlike collecting a Super Mushroom while Mario already has a power-up (similar to the Super Leaf and Tanooki Suit/Statue Leaf). Cat Mario and Cat Peach are available as a Mystery Mushroom costumes in Super Mario Maker. They are only obtainable after beating Cat Mario's Course and Cat Peach's Course, respectively. In Super Mario Odyssey, sprites of Cat Mario and Cat Peach's costumes from Super Mario Maker can be seen in various locations throughout the game. Hitting them using Cappy causes Cat Mario to drop coins or Cat Peach to drop a heart. In Super Mario Maker 2, Mario can transform into Cat Mario after collecting a Super Bell in Super Mario 3D World-style levels. 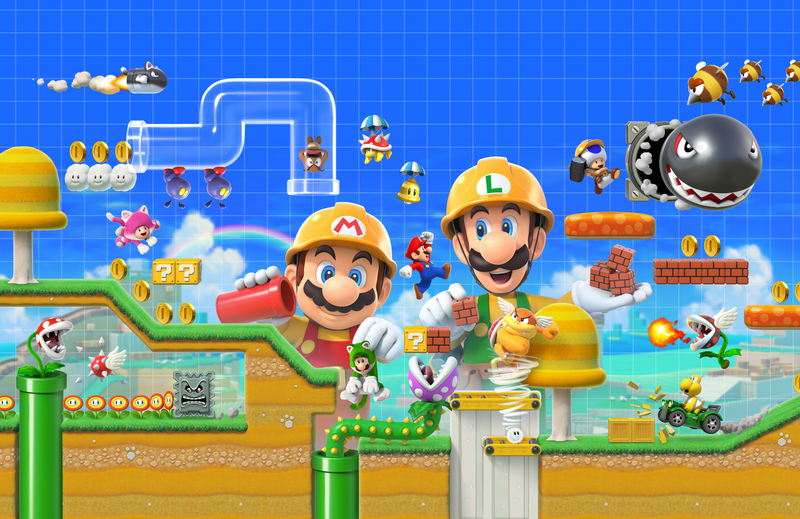 Luigi and Toadette are also shown wearing the Cat Suit in the game's group art. Cat Peach appears as a downloadable character in Mario Kart 8. She is part of the The Legend of Zelda × Mario Kart 8 DLC pack along with Tanooki Mario and Link, as well as four karts and eight race tracks. The Cat Cruiser also has a design that resembles Cat Peach. Cat Peach, along with the female Villager have more acceleration at the cost of their weight stat. They are the lightest middleweight playable characters in the game, being slightly lighter than Peach, Daisy, and the various Yoshis, but heavier than Toad, Koopa Troopa, the various Shy Guys, Lakitu, Toadette, Larry, Lemmy, Wendy, the babies, and Isabelle. Nin★Anne uses Cat Peach as the staff ghost for SNES Rainbow Road. Similar to Tanooki Mario, Cat Peach has different animations and quotes from her original counterpart, with many of them being meowing noises, or puns (e.g. "Meowtastic!"). Like with every character playable in Mario Kart 8, Cat Peach appears as a playable character in Mario Kart 8 Deluxe for the Nintendo Switch. Unlike the Wii U game, she is included within the base game and is available from the start. She now shares stats with the female Villager and the Inkling Girl, but is still among the lightest middleweight characters. Cat Mario and Cat Luigi appear as leader characters in Puzzle & Dragons: Super Mario Bros. Edition. Cat Mario is a Dark/Fire attribute member that is unlocked by clearing ★World 3, and Cat Luigi is a Dark/Wood attribute member that is unlocked by clearing ★World 4. Both of these characters can be trained so they reach level 99, and have similar HP, attack, and recover ratings with only a few differences. Cat Mario's main skill is called "Cat Walk", and it can be performed once every 12 turns; it increases by 1.5, for one turn, the attack power of any team member that has the Dark attribute. He also has a leader skill, the "Bell Rhythm", which raises every member's attack power by 3.5 after performing six combos consequently. Meanwhile, Cat Luigi's main skill is "Cat Dash", which lets the player move freely any orb that is on-screen for 10 seconds. His leader skill is "Bell Tempo", and it raises the attack power of all team members by 5.5 after attacking with five elements (attributes) at once. The Nintendo 3DS and Nintendo Wii U's eShop and Play Nintendo offers a video series called The Cat Mario Show which stars both Cat Mario and Cat Peach. The purpose of the series is to provide viewers with facts, strategy tips, quizzes and other content regarding the latest video games released for the Nintendo 3DS and the Wii U. In the Super Mario Mash-Up Pack in Minecraft, Cat Mario and Cat Peach are playable skins. Leather Armor is replaced by the Cat Suit. Cat Peach appears as a Shield-type, primary spirit in Super Smash Bros. Ultimate under the name Cat Princess Peach. Her spirit is an Ace-rank spirit with three support slots, and reduces the fighter's weight but also makes them faster. It can be summoned using Rover's and Baby Peach's cores. For this subject's image gallery, see Gallery:Cat Mario. When in Cat form, a jingling sound can sometimes be heard when the player jumps. 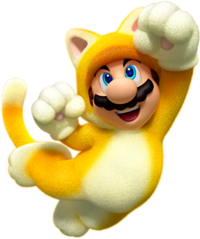 In an earlier version of Super Mario 3D World, whenever Mario transformed into Cat Mario, he would say "nyaa", the Japanese sound for a cat's meow. In the final version, this was changed to "meow". According to Super Mario 3D World director Kenta Motakura, Rosalina's cat suit is black (instead of her usual cyan) as a request from producer Yoshiaki Koizumi. Mario's Fat Cat, Rabbid Peach's No Pity Kitty, and Rabbid Luigi's Jade Jaguar from Mario + Rabbids Kingdom Battle are modeled after Cat Mario, Cat Toad, and Cat Luigi, respectively. ↑ 遠藤英誠. (January 15, 2017). NINTENDO SWITCH 体験会　SUPER MARIO ODYSSEY　２０１７年１月１５日. YouTube. Retrieved May 15, 2017. ↑ Nintendo. (June 16, 2017). Super Mario Odyssey Gameplay with Developers at E3 2017 – Nintendo Minute. YouTube. Retrieved June 16, 2017. This page was last edited on April 12, 2019, at 16:22.